Welcome to Boysville. 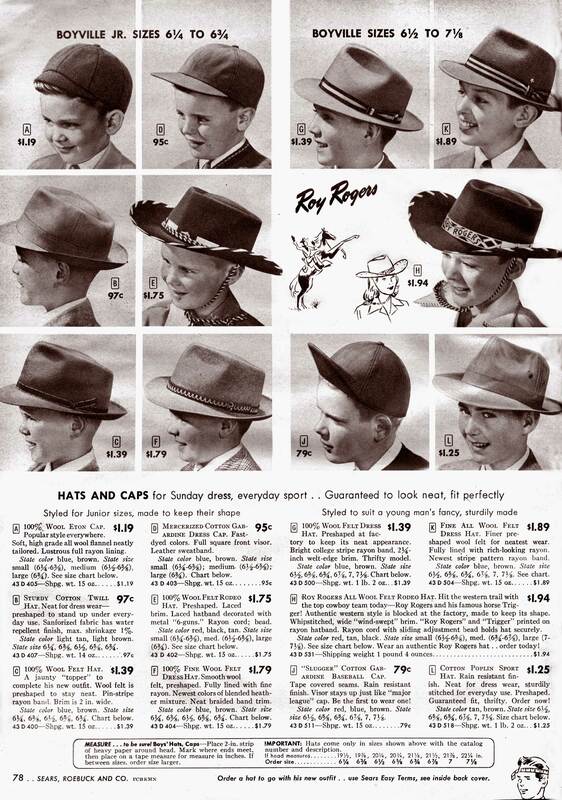 Of the 11 hats on this page, we have 2 cowboy hats, 3 caps, and the majority are fedoras just like Father would wear to work everyday. Prices ranged from 79 cents to $1.89. 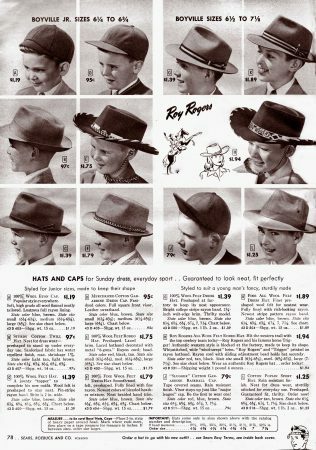 While the fancy dress hats occupy the most space on the page, one has to wonder if 1950's boys secretly coveted one of the other styles. Although the caps look a bit dorky decades later, Item J is an actual “slugger” baseball cap, just like the Major Leaguers would wear. So said Sears. Even better, Item H is an authentic licensed Roy Rogers All Wool Felt Rodeo Hat with a “wide, wind-swept brim” , a rayon cord with sliding adjustment bead, and twice the copy of other hats on the page. Roy's is also the only hat with an actual girl looking up in admiration. That has to count for something. On the other hand, most cowboys never went in for girls — they only had time for their horse. Trigger looks pretty pleased with Roy, too. Previous Previous post: Highest Fidelity. Lowest Prices.